Harry Johnson was born in Stokesley in 1889. He was the son of William Johnson and Annie Harforth, who married in Stokesley in 1882. The Johnson family was already long-established in the town, and Harry and his nine brothers and sisiters would have been familiar to all. (See Johnson A.E. - Harry’s brother, who also died in the Great War - for further details of the Johnson family). At the time of the 1911 census, Harry was a bricklayer (his father was his labourer!) 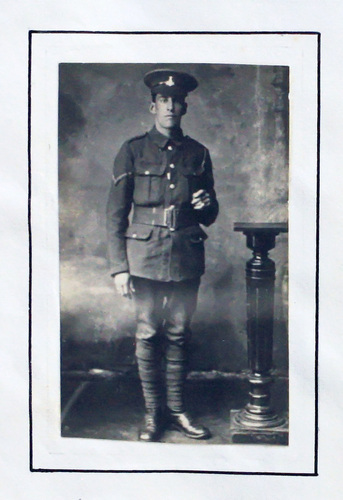 aged 22 and unmarried, living at home with his parents and six brothers and sisters at Brookside in the town. Harry Johnson seems to have enlisted at Northallerton in 1915. He joined the 4th Yorkshire Regiment (1/4 th Territorial) and was sent to France, arriving on 3rd November 1915. He may therefore have been in action during the early phases of the Battle of the Somme in July, 1916, but he was certainly in action in that sector later on. It was there where according to the Book of Remembrance he was wounded and died on 21st September 1916 at Camieres near Etaples. However, the official record Soldiers Died in the Great War 1914 – 1918 gives the date of Corporal Johnson’s death as 17th September 1916, and a list of fallen soldiers of the 4th Battalion gives his date of death as 16th September. The 4th Yorks was part of the 150th Brigade in the 50th (Northumbrian) Division. On 14th September 1916 the 50th Division took part in their first “set” battle to further Haig’s plans for the Somme. The battalion moved out to assembly trenches but had great difficulty as neither of the battalions on the flanks had left the communication trenches available. Positions had to be occupied over the open and this was noticed by the Germans who opened fire resulting in 40 casualties. On 15th September the 150th Brigade made good progress at first but the 4th Yorks right flank was “up in the air” (i.e. open to German fire from the side). This position was held despite heavy shelling. On 17th September the 150th Brigade’s commander ordered 5th DLI with bombing squads for 4th and 5th Yorks to attack and occupy Prue and Starfish trenches as far as the “Crescent”. This was accomplished although the 5th Yorks did not appear in time. On the 19th September the war diary states “The Brigade was relieved by 23rd Division 9th Yorks, 70th Brigade relieved the 4th Yorks battalion. The whole Brigade were withdrawn to the O. G. Line south of Bazentin Le Petit Wood. It had been raining heavily since 10am the previous morning. There was accommodation in the trench for about 100 men. Men came back absolutely weary, worn out and wet through. It was absolutely inconceivable how the fighting efficiency of the men could be kept up under these conditions. Fortunately the rain ceased about noon and the men were enabled in some way to dry their clothes in the sun"
From this account it is easy to see how a soldier in the 4th Yorkshire Regiment could have been wounded on any one of the dates given, and subsequently have died, leaving plenty of scope for confusion over the actual date of death. Bill Danby ascribes the date 16th September to the wound, probably following the casualty list mentioned above and this may well be correct. It is, however, absolutely certain that Harry Johnson would have fought in at least two of the actions described and that in one of these or a subsequent action he was wounded. He died later in hospital at Etaples. Corporal Harry Johnson was 27 years old when he fell. He was awarded the British War Medal, the Victory Medals and the 15 Star. His body lies in plot XVI A 4A at the Etaples Cemetery. Go to next soldier: Johnson J.R.